Playtime CD MP3 Ripper is a powerful audio CD ripper, CD to MP3 ripper and CDA to MP3 converter which can convert CDA to MP3 and rip CD to MP3. With this excellent audio CD ripper, CD to MP3 ripper and CDA to MP3 converter, you can convert CDA to MP3 and rip CD to MP3 at your own will. Playtime CD MP3 Ripper is an easy-using tool to convert your audio CD to MP3, WAV, WMA and OGG files. Makes direct digital copies from audio CDs and saves them as MP3s, WMAs, OGGs, or WAVs. Playtime CD Ripper Professional is very easy to use and have fast speed. Just click on one button a CDs will be extracted. 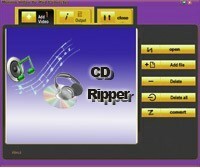 Playtime CD Ripper Professional can also Convert WAV files to MP3,WMA and OGG files. Download CD Tracks' titles from the Internet CDDB. It's fast, easy to use while powerful. By changing MP3, WAV and WMA settings, you may make a choice between speed and quality.